Do not move or divide once established. Very slow to show in the spring - mark in the fall. Food source for Monarch caterpillars. Beautiful color! As the name implies, this is a wonderful species for attracting butterflies. Monarchs are particularly fond of it. This is a native wildflower that is very hardy and long lived provided it has full sun and well-drained soil. It is also very wind tolerant. Brilliant orange-red clusters of flowers appear from midsummer atop 18 to 24 inch bushy plants. They make excellent cut flowers. Cutting back spent flowers will prolong bloom. Plant 12 to 18 inches apart. 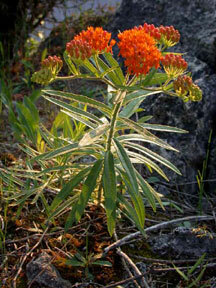 Asclepias has a tap root so care should be taken not to break it during planting. For the same reason, they should not be moved or divided once they are established. They are quite slow to appear in the spring. New shoots emerge from the soil (not at the base of last years growth) and have a tightly rolled spear-like appearance. It is a good plant to mark before winter so that it is not damaged with early spring weeding. The beautiful orange color (which is rare among perennials) makes this a choice addition to the border.